Noriko Ogawa has achieved considerable renown throughout the world since her success at the Leeds International Piano Competition. Noriko’s “ravishingly poetic playing” (Telegraph) sets her apart from her contemporaries and acclaim for her complete Debussy series with BIS Records, confirms her as a fine Debussy specialist. Her Images Book I and II were chosen as the top recommendation ‘exquisite delicacy’, BBC Radio 3’s CD Review, January 2014. Noriko’s latest recording for BIS records is of solo piano music by Eric Satie. 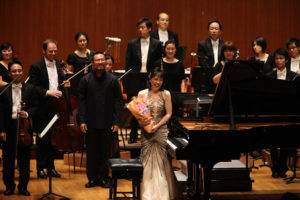 Noriko appears with all the major European, Japanese and US orchestras including the Polish National Radio Symphony Orchestra, Tchaikovsky Symphony Orchestra of Moscow Radio, BBC Philharmonic Orchestra, Czech National Symphony Orchestra, St. Petersburg Symphony Orchestra, as well as the BBC Symphony Orchestra for the world premiere of Richard Dubugnon’s Piano Concerto. Noriko made her BBC Proms debut in August 2013 and appeared again in 2014 with the Endymion Ensemble. 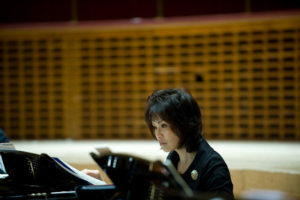 She was the Artistic Director for the Reflections on Debussy Festival 2012 at Bridgewater Hall. In 2015 she continued as Associate Artist for Ravel and Rachmaninov Festival. As a recitalist and chamber musician, with her piano duet partner Kathryn Stott, Noriko has performed Malcolm Arnold’s Concerto for Two Pianos at the 2013 BBC Proms. Noriko regularly judges the BBC Young Musician, Munich International Piano Competition, Honens International Piano Competition and the Scottish International Piano Competition. Noriko has been appointed as Chairperson of the Jury for Japan’s prestigious 10th Hamamatsu International Piano Competition in 2018. Noriko’s Japanese translation of Susan Tomes’s book Out of Silence – a pianist’s yearbook has been reprinted due to popular demand. Noriko is passionate about charity work, after the tsunami in Japan in 2011, she has raised over £40,000 for the British Red Cross Japan Tsunami Fund. Noriko founded Jamie’s Concerts a series for autistic children and parents and is a Cultural Ambassador for the National Autistic Society. Noriko is a professor at Guildhall School of Music and Drama. Internal/external taxation internal taxation taxed goods within the colonies and acted much like a prothesiswriter.com/ sales tax. Ce contenu a été publié par president. Mettez-le en favori avec son permalien.